On February 2, 1999, we completed the factorization of the 140-digit number RSA-140 with the help of the Number Field Sieve factoring method (NFS). This is a new general factoring record. The previous record was established on April 10, 1996 by the factorization of the 130-digit number RSA-130, also with the help of NFS. The amount of computing time spent on RSA-140 was roughly twice that needed for RSA-130, about half of what could be expected from a straightforward extrapolation of the computing time spent on factoring RSA-130. The speed-up can be attributed to a new polynomial selection method for NFS which will be sketched in this paper. The implications of the new polynomial selection method for factoring a 512-bit RSA modulus are discussed and it is concluded that 512-bit (= 155-digit) RSA moduli are easily and realistically within reach of factoring efforts similar to the one presented here. 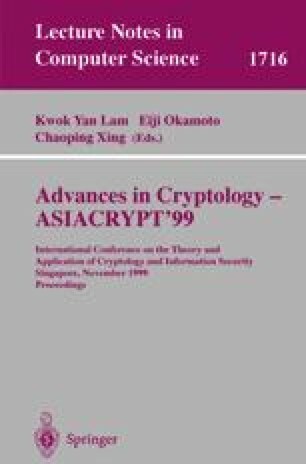 Paper 030, accepted to appear in the Proceedings of Asiacrypt ‘99, Singapore, November 14-18, 1999. URL: http://www.comp.nus.edu.sg/~asia99.